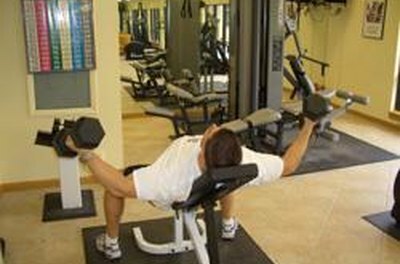 Shoulder and chest exercises can add strength and improve your golf game. For years, it has been debated as to whether or not lifting weights could help in the game of golf. Many believed that since a golf swing is more about the correct form rather than brute force, working out would not help. It might be true that training to become a bodybuilder will probably hurt a person's golf game. However, the right type of weight lifting done with golf in mind can be very beneficial. It does not matter if they are a man or a woman. A strong chest and shoulders can have a positive impact on a golfer's swing. Start in the seated position on an incline bench. Have your feet one shoulder's width apart and flat on the floor. With your elbows slightly bent and a dumbbell in each hand, raise your left and right arms together so that they meet in the middle. For an added dimension to this exercise, turn your wrist inward or outward at the point where the two dumbbells meet to activate either the bottom or top muscles in your chest. This will work your shoulder and chest muscles simultaneously. The goal is to tone your chest and shoulder, not to put on a lot of extra muscle mass. Do this exercise for three sets for 10 to 15 reps. Woman should use between 5- and 10-lb. weights, men should use between 15- to 25-lb. weights. This exercise is great for mimicking the motion of a golfer's back swing and follow through. 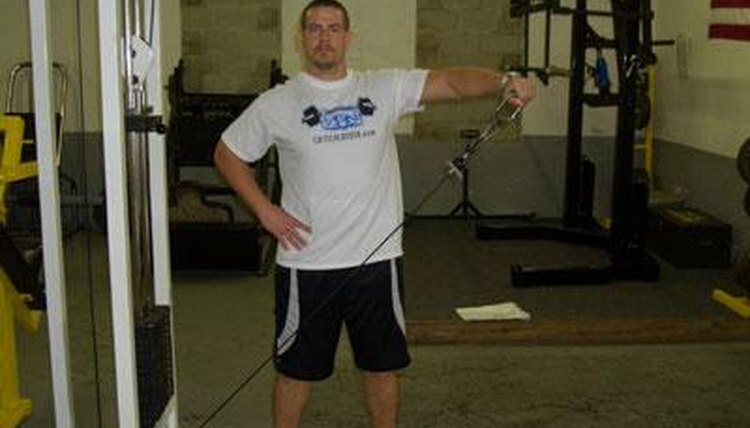 Begin by standing with the weight stack of a cable cross machine on your right side. Grab the handle with your left hand and slowly lift the weight out away from your left side, stopping at shoulder height and gently lowering the weight back to its starting position. Turn your body so that the weight stack is on your left side and repeat the exercise with your right hand. Do three sets of 15 to 25 reps at a low weight. Woman should use no more than 15 lbs, men should use no more than 30 lbs. Grab the parallel bars of the manual leg lift machine at the gym. This exercise can also be performed at home by sitting down in front of a chair and placing your hands flat on the chair's seat. Push up on your hands, locking your elbows, so that your body raises off the ground. Lower yourself back down, but do not touch the floor. Repeat raising and lowering your body for three sets of 10 to 20 reps. This exercise works your chest and the front of your shoulders.